↑ ३.० ३.१ Whole territory of the French Republic, including all the overseas departments and territories, but excluding the French territory of Terre Adélie in Antarctica where sovereignty is suspended since the signing of the Antarctic Treaty in 1959. ↑ (फ्रेञ्च) French National Geographic Institute data. ↑ ७.० ७.१ ७.२ Metropolitan France only. ↑ In addition to .fr, several other Internet TLDs are used in French overseas départements and territories: .re, .mq, .gp, .tf, .nc, .pf, .wf, .pm, .gf and .yt. 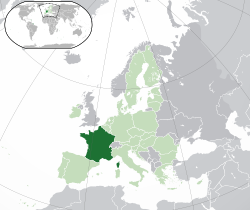 France also uses .eu, shared with other members of the European Union. The .cat domain is used in Catalan-speaking territories.